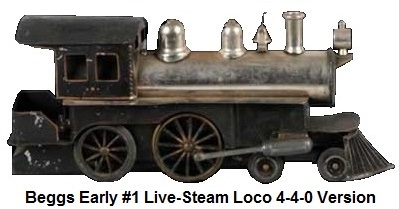 The very first live-steam toy trains were made around 1870, although some were possibly made earlier than that. Scale size demonstration models of trains had been made alongside the real prototypes since the beginnings of the railway age. The British were prolific in producing small-scale models starting in the 1860's. Eugene Beggs of Patterson New Jersey began manufacturing live-steam toy trains around 1871 with his associate Jehu Garlick. Beggs filed a patent for an improvement on steam driven toy trains that was his original design for the American market. It was an American profile locomotive with a cow catcher. Beggs manufactured the first American live-steam toy trains in 1 gauge and continued to produce them through the early 1900's. These toys ran just like the real trains on steam, with heated water forced into the steam chamber to drive the wheels. Begg's engines were a higher quality than the European imports and were therefore priced higher. The fact that the trains resembled American steamers was a selling feature. American department or specialty stores were the primary outlet for these early live-steam toy trains, and Beggs was the first American company to tap into this market with mass production. These train sets were a very popular toy and a very expensive toy in its day. 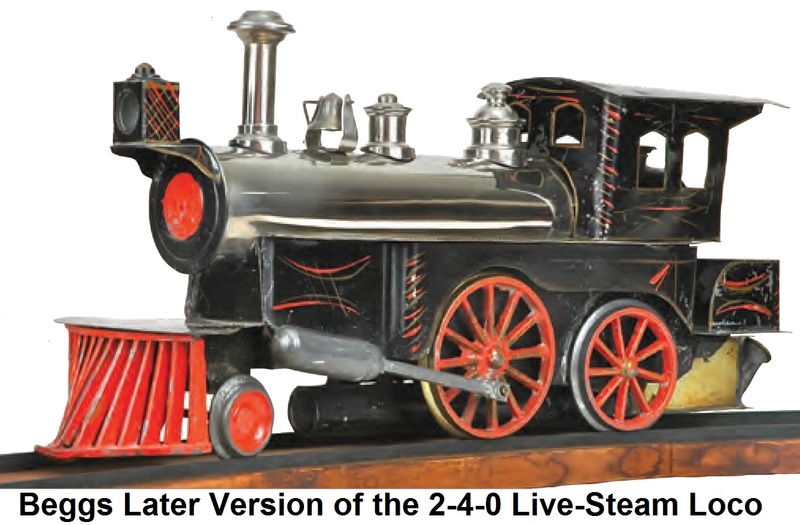 The live-steam driven toy trains were referred to as 'dribblers' because of the steam and water residue they usually left behind on many a kitchen or parlor floor. Beggs' engines were reduced to the simplest form possible: a pot boiler with alcohol burners and oscillating cylinders. There was no reverse cluster, whistle, or safety valve included. There was a sight glass installed in the back head. Firing the engines requires nothing more than filling the boiler to a little over half full with water and filling the burner with alcohol or ethanol. After getting up steam, a simple push in the desired direction gets it going. The action is smooth and effortless, since there are very few moving parts. These locomotives ran on low pressure (<40 psi) and the springs that were used to hold the cylinders against the yokes and frame doubled as safety valves. Speed was controlled by adjusting the wick setting and the train length. The locomotives had to be coupled to the 1-gauge cars to keep the speed in check. The earliest 4-4-0 type engines were fitted with coupled drivers and a flexible front truck that could negotiate an oval. Within a few years the engines were redesigned. Apparently the coupling between drivers was deemed too complicated, and the pivoting bogie was considered excessive. Beggs drivers were pre-set to only travel in a circle. In fact, straight track was considered more trouble than it was worth and most of Beggs' engines were reduced to 2-2-2 wheel arrangements, with a small pony truck permanently set at a fixed radius. Instead of the wheels being parallel, they were set at a radius to better follow the small diameter of the circular track. Engines were driven by only one larger driver, with a slightly smaller idler wheel behind it that looked like a second driver but really was not. When Beggs received his patent approval on September 19, 1871, United States Patent 119,006 was granted to Eugene Beggs for “Improvement In Toy Locomotives and Tracks.” This patent is unique since it covers two inventions. The live-steam trains and the sectional track. Beggs 1⅞” gauge track consisted of strap steel rails set in grooved solid-wood bases. Seven sections made up a 4'4" diameter circle. The track was pre-numbered underneath each section so that one knew how to assemble it into a circle. The metal strip rails were placed into the wood base so that at one end of the section each rail extended almost an inch beyond the wood base. At the opposite end of a section the rails started indented about 1 inch into the wood base. This design facilitated connection of 2 different sections of track by simply placing the rails of one section into the grooves of the next. The track manufactured and sold in the early years of 1871 to 79, has “PAT’D SEPT. 19, 1871” stamped on the top of the wood base, between the rails. The stamping does not appear on tracks made after 1879. Almost all Beggs track discovered today is curved, but Beggs did make and sell straight track. The 'American Standard' steam loco with a coal bunker instead of a tender, was the design used for most of Beggs engines but he did make a line of more expensive locomotives with tenders in 4-, 6-, and 8-wheel configurations. There were a total of six live-steam driven locomotives issued by Beggs. The assigned catalog numbers denoted the amount of elaboration that came with a particular engine. The #1 model had the simplifications described above but was stripped down without a headlight, bell or the decorative valence around the wheels. #2 and #3 were identical in appearance, with wheel valences and other trim, but the pilots were set at different radii. #4 was a 4-2-2 with flexible front trucks, and occasionally came with a tender. #5 was a 4-4-0, with a larger tender, and occasionally came with handrails and flagpoles. There have been several #4's discovered with 'water wings' - small cylindrical projections below the boiler that were intended to increase the surface area for the burner to heat. The #6 had an eight-wheel tender, water-tube boiler, and was considerably larger than the other versions. The hauling power of live-steam engines running on low pressure was not very efficient so Beggs made its car bodies of strawboard covered with lithographed paper. The cars were only of the passenger consist type, and made to be as light as possible. A large hatbox manufacturer was contracted to supply the car bodies. The cars also had tin roofs. Four cars comprised most of Beggs' rolling stock, including a postal car, baggage/postal car, and passenger car all from the same 7½” long body. A longer, 15” drawing-room car was the most popular. The cars were made in a variety of colors (yellow, blue, and green for the postal and baggage car; red, yellow, blue for the shorter passenger car; and brown, green, red, and blue for the parlor car. The cars occasionally came with road names and other forms of lithography. Roofs were usually radial in style, though some came with clerestories. Most of these cars had pot-metal wheels with two different diameters. The inner wheels were a smaller diameter that would tip the cars towards the center of the circle in order to compensate for the centrifugal force. The only known freight car ever located was a gondola or flatcar, which is mentioned in catalogs, but not pictured. A later series of cars was brought out around 1905 with metal bodies and Ives tinplate wheels. Jehu Garlick went out on his own in 1889, making trains that turned out to be almost identical to Beggs. Garlick patented a reverse cluster and included it in a few of his locomotives. This was Beggs' only real direct competition until Weeden came along with their Weeden Dart in 1898. Beggs indirect competition was all the cheaper imported steam trains and clockwork trains (which were far less difficult to deal with). By the late 1890's, Beggs was facing heavy competition from other American Firms and European manufacturers. To answer this challenge, he made his most deluxe train set. This set featured an American 4-4-0 (but made as a 2-4-0 #6) live-steam engine, two passenger Cars (one dark blue and one yellow), a circle of track and came in a custom wooden box. By 1900, electric trains began to catch on. Inexpensive clockwork and electric trains would eventually bring an end to the era of the live-steamers. Beggs did well, but never achieved the status of Ives, Märklin, Bing, or many other early toy manufacturers, which counted their employees in the thousands. Beggs counted his in the half-dozen. However, longevity can overcome size and Beggs' trains were manufactured with hardly any change for 37 years from 1872 to 1910. This was longer than almost all other American toy train manufacturers, except for the likes of Lionel, American Flyer, Hafner and Marx. It is estimated that Beggs manufactured 30,000 locomotives and, as a result, #s 1, 2, and 3 are not at all hard to find if you know where to look. However finding one in very good, original, and complete condition is quite difficult. Engines #4 and up are very difficult to find, with eight-wheel tender locomotives being almost nonexistent. Early Beggs sets in good condition have brought prices in the range of $5,000 to $7,000 at auction. Collectors typically don't run their Beggs engines because of concern for potentially damaging the original paint. Paying attention to setting a proper wick length, will avoid excess flame that can scorch the paint. Original instructions state “Expansion and contraction will sometimes cause the gauge glass to leak a little, this does not prevent the engine from working properly. A few grains of fine Indian meal, which should be placed inside of the boiler on the bottom part of the gauge glass after the water has been poured out, will stop any leak.” Passenger cars with lithograph paper can be a fragile commodity, especially when you have a train that's being run with hot water. If you get the paper wet, it will be ruined. Beggs designed some of their later locomotives to be operated on steam as well as by using compressed air. The back cover of the Beggs 1910 catalog illustrates an apparatus to operate Beggs locomotives on compressed air instead of live steam. The apparatus supplied compressed air to the locomotive via a tube with a pivoting attachment connected to either a tank containing compressed air or a hand pump. Either supply could be located at the center of the circle of track. Beggs is credited with several 'firsts', including the first to patent sectional train track, the first to mass produce powered miniature trains that ran on sectional track, and the first to manufacture track trains to be branded for Ives, having been sold by toy jobber Ives, Blakeslee and Co., the predecessor to Ives Trains. Along with A.S. Pennington, Beggs also invented the rotating water sprinkler that is still in use today. Eugene Beggs passed away in 1924 at the age of 88 years old. A great majority of the information known today about Eugene Beggs' life and his company is through the efforts of Walter Lucas, a prolific railroad historian who wrote two articles on Beggs in the August and September 1949 editions of Railroad Magazine. Lucas was also very well known as a collector and restorer of Beggs live-steam equipment.